Ahh . . . .the “shabbier the better”, right? 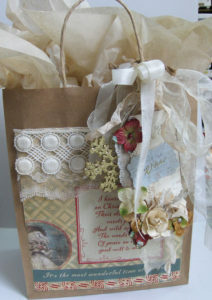 I had so much fun creating this special shabby Christmas gift sack, for a very special person. It’s got lots of fun goodies in it, but my favorite part is the SACK!! 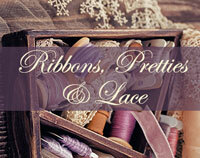 I dug into my stash of vintage laces for this, as well as using some other ribbons and laces I have. The tag is sort of a work of art, in itself . . .tags are really fun to “gussy up” too! 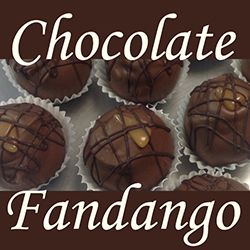 And I used my favorite palette . . .vanilla! (cream? off-white? natural? . .. whatever you like to call it!) A touch of color with some Petalloo flowers, and some vintage style Christmas paper. Hope you’re having fun getting creative with YOUR Christmas gift packaging! And if you’re looking for some inspiration . . .. you’re welcome!! Happy Creating!